Cut fresh or bought in a store, Americans love their Christmas trees. It is one of our strongest and most lasting holiday traditions. Nineteenth century Americans cut their trees in nearby forests. Today most real Christmas trees are grown on farms as sustainable crops like corn or pumpkins. 98 percent of all Christmas trees are grown on farms, while only 2 percent are cut from the wild. To ensure enough trees for harvest, growers plant one to three seedlings for every tree harvested. 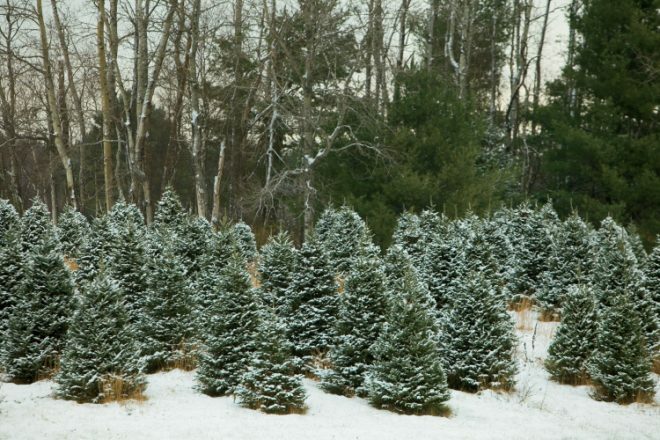 In 2012, 46 million Christmas tree seedlings were planted by U.S. growers. More than 2,000 trees are usually planted per acre. On average 1,000 to 1,500 of these trees will survive. In the northern part of the country, perhaps 750 trees will remain. 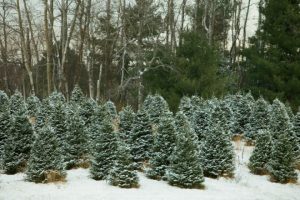 Almost all trees require shearing to attain the Christmas tree shape. At six to seven feet, trees are ready for harvest. It takes six to 10 years of fighting heavy rain, wind, hail and drought to get a mature tree. Most Christmas trees are cut weeks before they get to a retail outlet. It is important to keep them watered thoroughly when they reach your home. Artificial Christmas trees were developed in Germany during the 19th century and later became popular in the United States. These “trees” were made using goose feathers that were dyed green and attached to wire branches. The wire branches were then wrapped around a central dowel rod that acted as the trunk. In 1930, the U.S.-based Addis Brush Company created the first artificial Christmas tree made from brush bristles. The company used the same machinery that it used to manufacture toilet brushes, but they were dyed green. Artificial Christmas trees made largely from aluminum were manufactured in the United States, first in Chicago in 1958. Today, most artificial Christmas trees are made from PVC plastic. PVC trees are fire-retardant but not fire-resistant. Eighty percent of artificial trees worldwide are manufactured in China. By 2012, on average 10.9 million artificial trees were purchased in the United States.